The flavourful dressing not only replaces the oil but also adds robust flavour to this tender pork chop supper. Sprinkle chops with thyme and black pepper; set aside. Heat dressing in large nonstick skillet on medium heat. Add zucchini and red peppers; stir-fry 2 min. Push vegetables to edge of skillet. Place chops in centre of skillet; cook on medium-low heat 4 min. Turn chops. Stir vegetables; cook 6 min. or until chops are done (160ºF). Meanwhile, cook couscous as directed on package. Stir in nuts; spoon onto 2 serving plates. 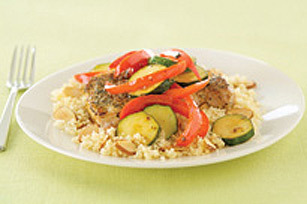 Remove chops from skillet, reserving vegetables in skillet; place chops over couscous mixture. Cover to keep warm. Add jam to vegetables in skillet; cook on high heat 2 min. or until jam is melted and vegetables are evenly glazed, stirring constantly. Spoon over chops. Spread almonds onto microwaveable plate. Microwave on HIGH 3 min. or until lightly toasted, stirring after 2 min. The apricot-glazed vegetables are a perfect complement to the pork chops in this elegant supper. And as a bonus, the red pepper provides an excellent source of both vitamins A and C. Eating right never tasted so good!